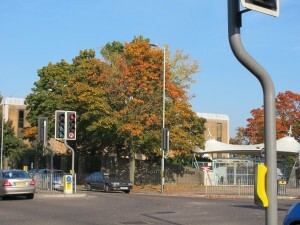 The plans consist of a residential development of 85 dwellings comprising 6 apartment blocks to accommodate 75 x 1 and 2 bedroom apartments together with two terraces of 3 x 3 bed houses and 1 terrace of 4 x 3 bed houses; provision of 120 parking spaces, associated landscaping and vehicular access from Cambridge Road, Willian Road and Hampden Road following demolition of the existing college building. Our comments are:- “Hitchin Forum does not object to the principle of residential development on this site; however the current proposals do not sufficiently consider the following matters and therefore our comments should be considered as an objection. Walsworth was originally a village about a mile north east of Hitchin, it has now been incorporated into the town, but still has a recognisable identity of two-storey street fronting development in red brick with slate roofs. The site is located at the heart of this “village” and the proposals do not reflect this context in terms of their form and materials. Reviewed in the light of the Hitchin Urban Design Assessment 2007, where the site appears to be surrounded by “Pre-war/Interwar Semi-detached” or “Post-war Suburban” zones, the proposals are at variance with the recommendations for block sites. Closed blocks of two-storey or three-storey terrace houses are recommended for higher density block sites in these zones. The site is also identified as being within a zone where densities should be “protected”. The objective of this protection is to create a low-density boundary between the settlement and the surrounding countryside. We therefore consider that the proposed development of three and four storey flats is at variance with this assessment and will be out of scale. • the authority is seeking low-cost social rented family accommodation, which it is considered that this development could not reasonably provide without significant impact on the viability of the development. The recent Hitchin Forum response to the Draft Local Plan considered this question of viability and pointed out that developers’ financial offers for sites need to be at a level which recognises that significant provision of affordable housing is called for in the current local plan. This does not appear to have been recognised in this case neither do the proposals recognise the character of local affordable housing need. The level of affordable housing provision under the current plan on a site of this size is 25% The Heads of Agreement for the Section 106 agreement identify that a payment of £53 002 will be due to the Authority with respect to affordable housing. This is considered to represent a provision of affordable housing on the site of 5% when the Vacant Building Credit is taken into consideration. Clearly the proposed figure is a drop in the ocean when compared with the actual need for affordable housing. We note that the Heads of Agreement refer to the impact of the Vacant Building Credit and also mention that the scale of contributions to be made under Section 106 will affect the viability of the scheme and in turn the funding made available to North Herts College. However, the Forum considers that in the light of the shortage of residential development land in sustainable locations, such as this one, and the pressing need for affordable housing, the funding needs of the College and the financial outturn for the developer should take second place to a substantial affordable housing provision on this site. It is clear that this level of provision would not be compatible with the proposed pattern of development on the site. With respect to the gross internal area of the proposed flats we note that the one-bed flats will have an area of 45 m2 approx. and the two-bed flats will have an area of 61 m2 approx. The recent Forum response to the Draft Local Plan identified a concern that large numbers of small flats have been built in Hitchin and that there is a need for more accommodation for families. We have therefore compared these areas with the provision recommended by the Greater London Authority and with the conclusions of the Royal Institute of British Architects report “The Case for Space” and note that the one-bed flats have an area approx. 5.5 m2 less than the their recommendations and the two-bed flats have an area approx. 7.5 m2 less. These reductions in area will have an impact on the quality of life of the residents and affect the long term desirability of the development. Hitchin Forum also questions the proposed Section 106 contributions towards improvements on Walsworth Common and considers that this contribution would be better directed towards the maintenance of the Walsworth Community Centre, which is under threat of closure. The perspective images of the development clearly show that the development will not be gated. The Forum welcomes this approach and will continue to press for the development to be open for public access. The images also clearly show that the junction of the development with the exposed incomplete gable of the three-storey shops on Cambridge Road is insufficiently considered. The opportunity should be taken to ameliorate this intrusive element in the street scene. The closing date for comments was October 6th.